Bit Tooth Energy: Deepwater Oil Spill - the last cement job? The first relief well at the Deepwater Horizon site appears to be close to setting the last casing in the new hole, before the final step of drilling down to and through the original well casing. While this is bringing the initial major concern (stopping the oil flow) closer to closure, there is still some time to go. Wind and weather are not cooperating and the depression over the Yucatan is reminiscent of Alex, which held up work until wave sizes dropped at the site. Sadly wave heights are now back up to the point that they are holding up work on completing the connections for the new cap to the well. At present, while the connection to the Helix Producer will carry an additional volume away from the BOP through the kill line, perhaps allowing some of the vents on the original cap to be closed, some leakage must still be maintained. Since the stage is ripe for the final installation of casing at the lower end of the relief well, I thought I would just repeat a very simplified description of the process that is going on, so that you can understand the delay, before they drill over to intersect the leaking well. As the well has been drilled down through the ground, it passes through layers where the rock might either be porous enough that the drilling fluids will flow into them, or might itself contain fluid at pressure that can flow into the well, and dilute that mud. In order to stop either event from happening, the drilling process is stopped and a process undertaken that seals off the rock on the sides of the well from the well itself. This is known as casing the well, and running casing and for this relief well the process has been carried out a number of times as the well was driven. The well is now at the point that the final casing is about to be set, following which the connecting passage over to the flowing well will be undertaken. The drill string is first taken out of the hole, and the drill bit is removed. The drill string can then be used to lower a larger steel pipe into the well to encase the well, from the bottom of the earlier lining run down to the current bottom end of the well. (Hence the name casing). Having this continuous length of casing in the hole will stop, say water, from getting in and diluting the drilling mud or the mud itself from flowing out into the rock. But if this was all that we did, then it would still leave a problem, since the steel pipe does not completely fit up against the rock wall created by the drilling bit. In other words there will be a gap between the casing and the rock wall, and this will allow fluids to travel up or down. This gap has to be filled, and the filler is normally a special form of cement. The casing has, therefore, been fitted with a small ring, called a shoe, that fits on the bottom end of the casing as it is set in place. The way that the cement is placed is simple in principle, but a fair bit more difficult to do properly and effectively. Think of the long thin tube of casing, filled with a cement that acts something like toothpaste. This cement has to be pushed down the tube so that it squeezes out of the bottom and then flows back up between the casing and the rock wall, filling all the gaps as it is pushed back up to the top of the previous run. Particularly when this last casing is run, it is important that the gap is fully filled. This is because this is the casing that seals the well so that no fluid can escape back up around the casing, rather than flowing from the relief well into the well that is flowing oil and gas. Since the cement will move more easily thorough a larger passage, than a very narrow one, this gap has to be above a certain minimum size. Small centralizers are attached at points down the steel casing to keep it in the middle of the hole, rather than pressing up against one of the walls (since this might leave an open channel up through the cement). (And it was the number of these that caused some of the concerns in the final casing of the well that the Deepwater Horizon ran). 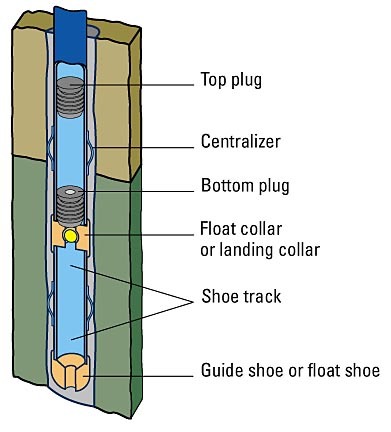 A small plastic plug (the bottom plug) is put into the casing ahead of the cement. This separates it from the mud that is already in the hole. It is fitted with wipers, that clean mud from the walls of the casing, and it is pushed down to the bottom of the casing by the cement that is pumped into the well behind it. There are some pictures of some of the tools and descriptions of the process here, here and here. 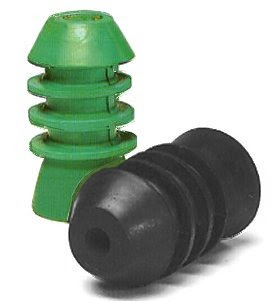 Once the bottom plug gets to the end of the casing, there are ports it passes that allow the cement to flow out of the casing and back up the outside. Once the cement has been pumped into the casing a second, top plug, also fitted with wipers, is put into the casing and this is then pushed down by the conventional drilling mud. As it is pumped down it forces the plug down, and the cement out and back up to the surface. Because of possible variations in hole size and other possible problems, perhaps about 50% more cement might be pumped into the well than the calculations might suggest. When the top plug hits the bottom plug, then there is a pressure spike at the pumping station, telling the operator that it is finished. The rig then waits on cement (WOC) until the cement is hardened. The drill pipe can then be put back in the hole with the mud motor on it ready to make the connection over to the flowing well. At present the debate over exchanging the cap on top of the old well does not appear to be totally settled, and Admiral Allen has been meeting with BP to move this part of the operation forward. Mr Hayward re-iterated BP’s commitment to Azerbaijan and to continuing successful cooperation with the government and SOCAR. Mr Hayward once again highlighted the importance of the Azeri-Chirag-Gunashli and Shah Deniz oil and gas development, as well as the Baku-Tbilisi-Ceyhan and South Caucasus Pipeline projects to Azerbaijan, the region and global energy markets. I’ll add information on oil production when available, since the BP server appeared down when I just went to access it. This country gives 10 times as much money to big companies like BP than they do to welfare and food stamps combined. What’s the difference between welfare for companies and small people? Companies take their money overseas, they create unsafe work conditions, they use lobbying to corrupt our government, they bring jobs overseas, they hire great accountants to hide money and they hoard massive amounts of wealth. Sure Big companies create jobs how can small companies compete without massive subsidies and favorable regulations? How can people bring themselves out of poverty when the game is tilted against them? Stand for better regulation of these industries quit worrying about the few poor people you see getting a “hand out” and start worrying about the few rich people you don’t see stealing our collective futures. I'm not sure how these leaks happen so often. It seems like they never happened before, or at least with less frequency. Then right when everyone started worrying about drilling, all of these spills start happening. It's a little fishy to me. I don't think it has much to do with the cement casings.